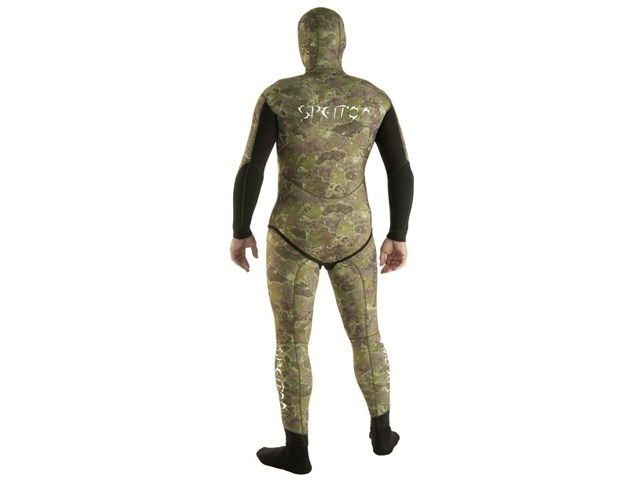 Spearfishing-Shop - Smooth wetsuits for spearfishing - Wetsuit Spetton Med Green Camo 3 mm. • With the purpose of developing new difussions of the spear fisher shape with the bottom of the sea, we have designed our new program "Distorssion Camo" for difussing the shape for both sand and seaweeds areas. • It has a preformed cut for maximum confort, with knee pads, elbows and crotch reinforced in Supratex. • New antiabrasive chest pad reinforcement for speargun loading. • "Water Dry System" neoprene smooth seals in extremities. • Button closure relax click with Supratex reinforcement. Inside microporous Cell Pluss II. Main page » Catalogue » Wetsuits - Camouflage » Wetsuit Spetton Med Green Camo 3 mm.